Is there a better alternative to eMail Bounce Handler? Is eMail Bounce Handler really the best app in Email category? Will eMail Bounce Handler work good on macOS 10.13.4? eMail Bounce Handler is a bounce e-mail filtering and handling tool. Bounce e-mail (sometimes referred to as bounce mail) is electronic mail that is returned to the sender because it cannot be delivered for some reason. Unless otherwise arranged, bounce e-mail usually appears as a new note in your inbox. E-mail users can encounter bounce e-mail because an addressee has changed his or her address, because their mail box is full, because the note is misaddressed, or for some other reason. 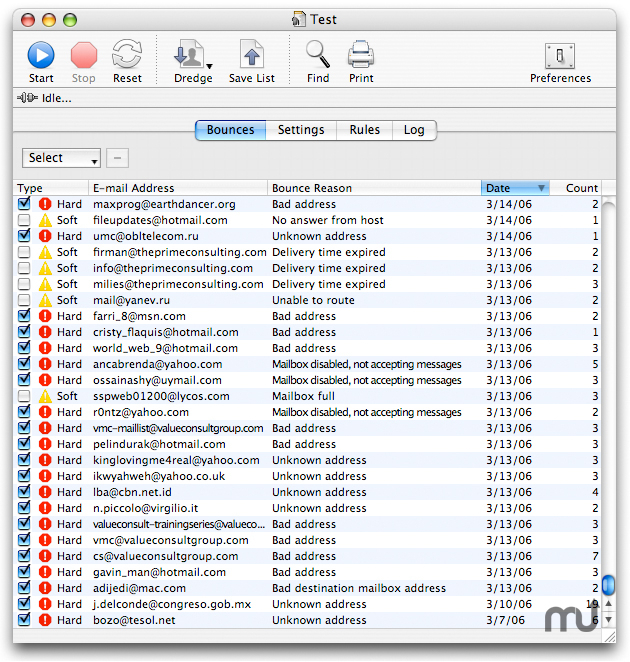 Bounce e-mail can be handled by a program when sending e-mail to a list and most e-mail distribution list vendors include this capability. Such a bounce handler can retry later, unsubscribe the addressee from the list, or take some other action.